Remembrance Sunday, 12 November 2017, commemorates the signing of the armistice between the Allies and Germany at 11am on November 11, 1918. There is a two minute silence held on the eleventh hour of the eleventh day of the eleventh month. The National Service of Remembrance will be held at the Cenotaph on Whitehall, at 11am. Up to 10,000 veterans will take part in the March Past. Anybody is welcome to go and watch, but do go early. Remembrance Sunday is a day for the nation to remember and honour those who have sacrificed themselves to secure and protect our freedom – WW1, WW2 and at other occasions. Red poppies are one of the few plants to grow naturally in the barren earth of former battlefields – around the bodies of dead soldiers. Today we wear them as a mark of respect for those sacrificed their lives to enable us to live in freedom. The profits go towards the welfare of service veterans and their families (£75 million last year). Get a fab & funky new outfit at the Brownfield Cabin, 82 St Leonards Road, E14 0QU. Plus! 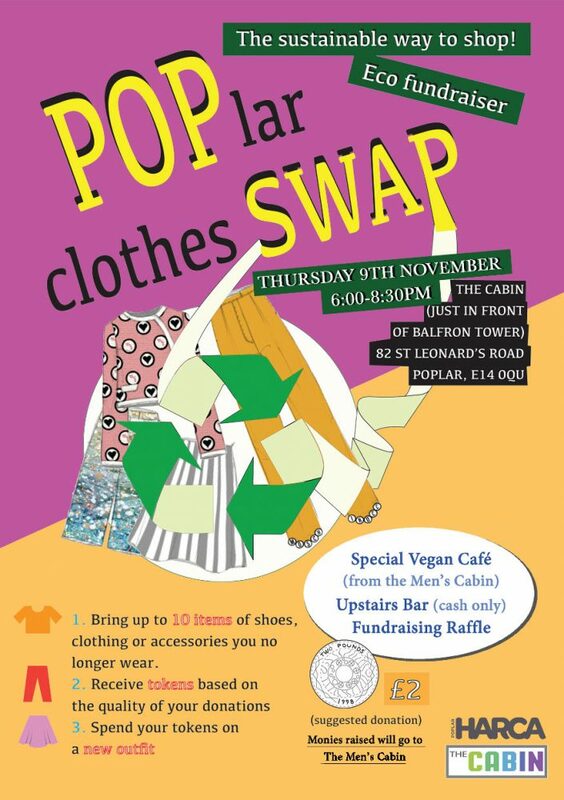 The Men’s Cabin Vegan Café & Brownfield Social Club Upstairs Bar (from 8:00pm) Thursday 9th November 6:00 – 8:30pm. The local police inform us that there will be a number of closures of Front Counters and Community Police Bases taking place by the end year. They say that most crime is not currently reported at police stations. Just 8 per cent of crimes were reported at police front counters in 2016. Brick Lane Police Station receives an average of just 2.4 visitors per day. The Brick Lane Front Counter will be closed this December and subsequently, the building itself will also be sold. Bethnal Green Police Station and the Front Counter will remain open as it is. This Station will also be the sole Front Counter that will be open 24/7 in the Borough. If the matter is an emergency (life or death situation, immediate risk of damage to property), always dial 999. If the matter is not an emergency, please dial 101. Visit www.met.police.uk, click on the link named: REPORT and follow the links. The National Fraud Intelligence Bureau (NFIB) and Action Fraud have recently noticed that fraudsters have been impersonating bailiffs requesting payments for “phantom” debt. The fraud involves being cold-called by someone purporting to be a bailiff working on behalf of a court, attempting to recover funds for a non-existent debt. Tower Hamlets Sport & Physical Activity update – click here for the full information. The Theatre Royal Stratford East has the pantomime Rapunzel on stage from Mon 27 Nov 2017 – Sat 13 Jan 2018. So after all these years no more Police Station for Bow. Ray Gipson.